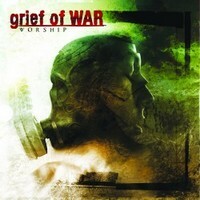 Grief Of War are from Japan, from Tokyo where the band was founded in 2002. Now their 2nd album, Worship, will be released by Prosthetic Records. Without reading the info sheet you would think they are from Europe or America, they don't sound Japanese. Grief Of War play old-school thrash á la old Slayer, Overkill, Kreator and Metallica. Reading this should make every thrasher happy and the sound is authentic and raw - no trendy sounds! Unfortunately they lack the punch bands like Warbringer do have. The opener Crack Of Doom is a thrasher which honors Slayer. The title track is spiced up with mosh parts and invites you to bang your head. You'll find reminiscences of Kreator anywhere on this album and vocally there are similarities with Mille and Schmier. But their songs lack some originality and it seems like you have heard everything before... somewhere else - and better. The guys know how to play which the guitarists show in solos, but again, the songs lack something. Anyway, Grief Of War deliver a decent old-school thrash album - and die-hard thrashers will like it. A bit more originality would to them good, but old-school thrashers should give it a try!